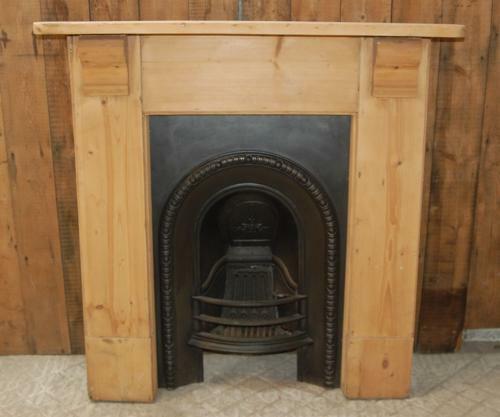 A lovely, classic style, antique pine fire surround with a Victorian, cast iron, fire insert. The fire is petite and ideal for a bedroom or smaller reception room. The pine surround has been stripped and is ready for a wax, oil or paint finish. The surround has a classic design with two simple carved corbels below the mantel. The fire insert has a repeating border and the smoke flap has an attractive leaf motif. The original front bars have a curved design. The fire has kite mark on the back which was a method of dating the fire. The mark has eroded slightly making it unreadable but the fire dates to pre 1884 when the dating system changed. The fire and surround are solid and useable but do have some signs of use and wear consistent with age. There are some marks and some wear to both items. The surround has some damage to one side with some cracks, splits and holes. The insert has had a repair to one side where the iron has bulged and split due to heat. There is a chip to the bottom front bar. Some slight scratches, marks and surface rust patches. The back has surface rust as expected. A very pretty fire and surround that would be ideal for a period home.